This is it cookies, my last blog post! *tear* In case you missed it, please read this post as it explains my thoughts and feelings regarding retiring from the blog life. 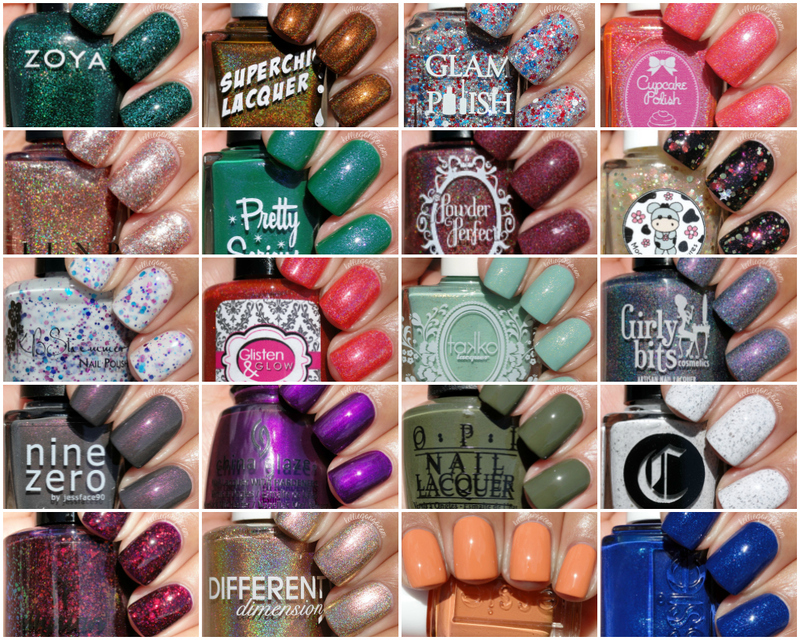 For today's post I wanted to share my favorite 20 nail polishes from this year. There are way more than 20 that I loved of course, but these stood out just a bit more from the rest for one reason or another. The blog post where I reviewed each polish is linked with the shade name if you're interested. In no particular order, see all my picks after the jump! Hi there beautiful! I have the Holiday 2016 collection from OPI to show you today, the Breakfast at Tiffany's collection! This has to be one of my all time favorite movies, it's soooo good! There are twelve colors in the regular polish line and six in the Infinite Shine line, so you're in for a long post today because I'm giving them to you all at once, yay! Breakfast At Tiffany's is a pinky pale pearl with iridescent shimmer. Goes on a bit streaky, but evens out in three coats. This dries very fast because of the matte finish. I covered it with a top coat, I wasn't sure if it was meant to stay matte or not, but either way I prefer it shiny. Apartment For Two is a vibrant raspberry pink crème. Very easy, smooth formula and opaque in two coats. Rich & Brazilian is a luxe and lustrous eggplant purple with tons of shifty shimmer and flakie particles. Went on a little uneven at first, but I got full coverage with two layers. I Believe In Manicures is a light blue crème, not quite Tiffany blue mind you, but similar. I believe there is a copyright on the exact Tiffany blue shade so no one can use it but them. This was quite thin. I almost got full coverage in two coats, however I needed three for complete opacity. Got The Mean Reds is a mid-tone red crème. This has a great formula, a one coater! I used two here like I usually do. This color is not particularly exciting to me personally, but I like the name. Black Dress Not Optional is a dark charcoal almost-black with a gossamer glaze of silver microshimmer. This was lovely to apply, thin but easy to manipulate. Slightly brushstrokey due to the shimmer, but these types of colors don't look bad with them in my humble opinion. Meet My "Decorator" is a bright warm red jelly crème, squishy and a little bit streaky, surprisingly. I used three coats to get full coverage on this guy. Sunrise... Bedtime! is a glitter bomb with a slightly pink tinted base filled with pink holographic glitter. Most people will probably layer this but I had to try to build it up to see if I could wear it on its own. Kinda thick and there may be some texture pieces in here, because it eats top coat like crazy. I put on three coats and it looks pretty great, blings so hard you probably wouldn't notice any open spots anyway! Can't Read Without My Lipstick is a deep maroon jelly crème. Quite opaque with that shiny squishy quality I adore. Two coats. Five-and-Ten is a pale champagne foil with a pink tinge full of shimmer. I am in love with this, it's classy but still flashy! Makes me think of New Year's. The formula is on the thinner side and I needed three coats here. Fire Escape Rendezvous is described as a matte glittering ruby. Assorted sizes and shapes of shard glitter pieces punctuate the base and make a chunky problem child. *sigh* I really, really don't understand why they keep trying this "glitter in a metallic base" formula thing. I had to shake this up a lot before I put it on because all the glitter pieces sink to the bottom. Dries matte, but I put on a thick shiny top coat (Pretty Serious Cosmetics Plump Up the Volume for the win!). Champagne For Breakfast has a clear base filled with silver holographic glitter and maybe some texture particles, but I can't be sure. I layered one coat over Rich & Brazilian and I love it. I actually did try to get this opaque on its own, but after the fourth coat my nail bed was still peeking through pretty obviously. You could try the sponge method if you really want to wear it alone though. Now on to the Infinite Shine colors! These are the first ones I've tried from OPI so I can't speak to their wear time or the difference in formula. They are a bit more expensive though, and are designed to be used with the Infinite Shine prep and top coat. Party At Holly's is a vampy, deep oxblood jelly crème. Quite opaque, I found this to be lovely and plush, and very shiny. Two coats. Girls Love Pearls is a pearl white metallic. This is the shimmery, silk type of metallic, not a foil and not a frost. Very brushstroky, but surprisingly easy to apply. With two coats you can still kind of see my nail line but these type of colors look ok like that to me. I thought I was going to hate this, but I actually think it looks pretty good on me. I Believe In Manicures is the only color that overlaps both polish and Infinite Shine. Almost identical to the polish version, it's a light blue crème but this one was a touch lighter and shinier. Seemed less streaky too, but I still needed three coats. Can't Tame a Wild Thing is an orangey red jelly crème. Thin but easy to control, which I appreciate in a shade like this because no one wants to have to clean it out from under their cuticles, am I right? I used three coats for full opacity. I'll Have a Manhattan is a midnight purple jelly crème. Another nice opaque formula, easy to apply and dries nice and shiny at two coats. Ring The Buzzer Again is a scarlet jelly crème. On the thick side, but in a good way. I used three coats here because I could still see my nail line a little bit, but you may be able to get away with two. OPI polishes can be purchased at professional salons and retailers like Trade Secret, Sally Beauty, and Ulta. Let me know what you think of this collection! I get what OPI was going for, classic colors for a classic movie, but I still wish they would've thrown in a few adventurous shades. Do we really need soooo many such similar reds?? I think not. Anywhoooo, my favorites are Breakfast At Tiffany's, Black Dress Not Optional, Party At Holly's, and Five-and-Ten. Tell me yours! Are you a fan of the movie too? Hey folks, I'm here today to show you the next KBShimmer collection coming soon in January, the Office Space collection! “Sometimes you want to be a bit naughty, but stay within the professional lines. The Office Space collection consists of eight naughty and neutral shade ideas for the office. These shades add a pop of color and sparkle to your nails, while still keeping the boss happy." My job doesn't discriminate against any nail polish colors, thank goodness, but if they did, these colors would be a revelation! Take Back CTRL is a dusty rose mauve crème. Leans purple but is on the border of the pink family I think. Excellent formula, buttery and smooth. Opaque in two coats. A Hint Of Manila is in the famous KBShimmer mega flame finish, this has a light tan base loaded with tons of holographic sparkle. A touch thick but not difficult to apply. This is two coats. Dries with a glitter texture so you'll want a thick layer of top coat or two for a smooth finish. Staple Relationship is a deepened gray with slight purple undertones full of metallic silver flakes and holographic sparkle. This is in the KBShimmer birthstone finish, a favorite of mine. Super opaque, a one coater! I used two anyway though.The flakies dry flat so there is no texture to this one. Caught On Tape is a pale pink mauve crème. This is simple and pretty, really classic. Lovely formula, really excellent for such a light color! And quite opaque, I only needed two coats. Fax Of Life is a dark platinum grey linear holographic shade. I was pretty floored at how opaque this guy was, almost a one coater but I used two for 100% coverage. Easy and breezy and great! Supplies Party has a warm vanilla cream base loaded with metallic flakes and holographic sparkle. Another birthstone finish shade with a great formula. An unexpected favorite, two coats. Cubicle Pusher is a muted dusty grape holographic. Great formula, just a little on the thinner side. I used three coats here but you could probably get away with just two, I think I was being cautious haha. Makin’ Copies is a pale silver filled with white shimmer and holographic pigment. The holo in this is subtle, but it's definitely there. A bit more sheer, but being an almost white, that isn't really unexpected. I used three coats here. This collection will launch on Wednesday, January 4th on the KBShimmer website. The polishes will sell for $9.25 each. For international folks, check out Harlow & Co., though I'm not sure what date they will be available there. Let me know what you think about these neutral beauties!